Whenever I go to the beach I have to slather on the sunblock and hide under an umbrella, and even then I still sometimes get burnt. UV exposure is the leading cause of skin cancer. Although everyone should take proper precautions to limit their exposure, people with lighter skin tones, like myself, have less natural protection and show a higher incidence of skin cancer. But what if I could put on a lotion that would make my skin produce more of its own pigment to give me that extra layer of protection? Researchers in Boston have been working on a way to do just that. The researchers were able to make a small molecule that absorbs into skin and helps jump-start skin pigment production. All without the use of UV. The variety of skin colors in humans are caused by melanin. The darker the skin, the more melanin you have. This pigment absorbs UV and protects the skin cells from UV damage which causes skin cancer. When you spend a lot of time in the sun or you use a tanning bed, your skin goes into crisis mode and produces more pigment to help protect you. That’s the basis of a tan. These researchers wanted to make a way to get more pigment without exposing yourself to UV. To do that, they made a small-molecule that makes your skin produce more melanin. 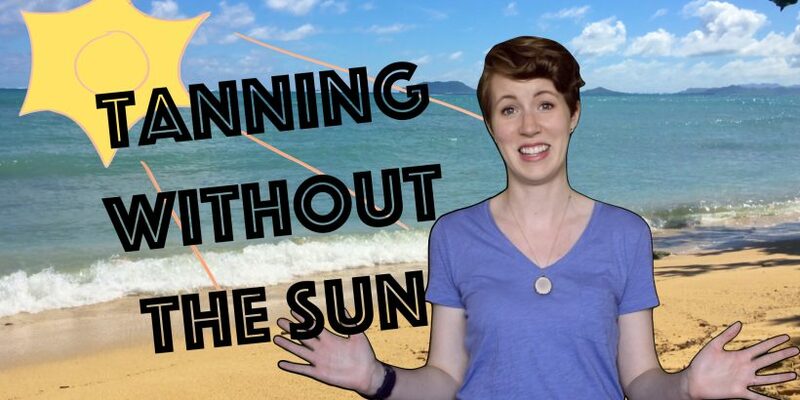 Essentially it’s sunless tanning! Their molecule enters the pigment producing skin cells and stops a protein that usually tells the master pigment regulator to slow down. Without that protein, you get more melanin. In order to make sure their molecule worked, they tested it on both mice and on human skin taken from biopsies. They were able to get visibly darker skin on the mice and the human skin in a few days. Plus the treatment was also completely reversible! The increase in melanin caused by their molecule slowly faded away after 2 weeks! While they haven’t tested their molecule on people yet, their results in mice and skin biopsies are really promising. It’s possible that this kind of UV-free tanning could be used to treat people with serious sun-sensitivity, vitiligo, or even certain forms of albinism. Let alone the possibility of getting a tan without damaging your skin. Maybe some day I’ll be able to add another step to my skin care routine and worry a little less about skin cancer. Information in this article from Mujahid et al. “A UV-independent topical small-molecule approach for melanin production in human skin” Cell Reports (2017). Thanks for the useful information on sun tanning. Just one question. What the approximate time you can spend under the sun for a good tan? Very nice blog! I have seen and read this blog about tanning without sun. This is really awesome. I like it a lot. Thank you and keep posting this type of blog.